I posted about this idea last July and finally got around to creating my own recently! This was the best idea for a simple birthday treat for my hubby this year. He was busy studying for his boards and didn't have a second for any kind of birthday celebration. So, I figured some sugar and some "sweet thoughts" would help him at least stay awake and focused on studying hard! I found the jar at WalMart for $6.97 and made my own tag. The "sweet thoughts" were sentiments including silly dentist jokes (he's in dental school), memories from our dating days, little things I love about him, thoughts about things he's good at, little thank you's, etc. Your blog has been recommended to us as an interviewee's favorite blog! We would like to do an interview with you about your blog for Blog Interviewer. We'd like to give you the opportunity to give us some insight on the "person behind the blog." It would just take a few minutes of your time. The interview form can be submitted online here Submit your interview. I love this idea and just posted it as my weekly "GOOD FIND." You can view the post here: http://itisagoodday.blogspot.com/2010/05/good-find-sweet-thoughts-jar-and-winner.html. Thanks so much. I can't wait to try this. back in 2008 my hubby had a two week business training in LA. So we were not going to be seeing each other and he was supper nervous. So, I put a quote or message in a box. One for each day he would be gone and some Hershey kisses. He really loved it and in the mornings his co workers looked forward to hearing what the days message was. 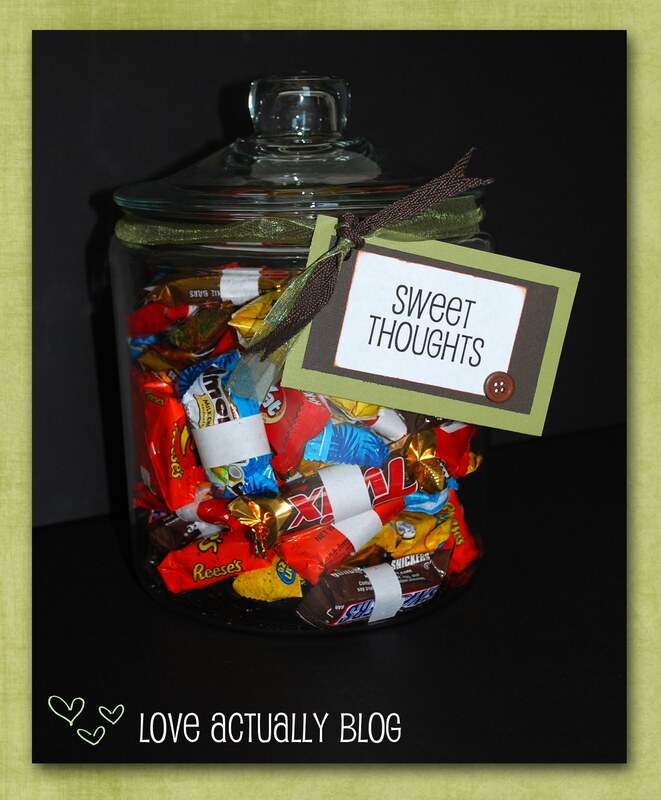 I like the idea of putting the message around the candy! What a great idea. I did this a few years ago with the Reisens (sp) candies. My husband and I were apart for 2 months because of my job and so when we met up for a weekend a month into it, I presented him with a jar of "reisens why I love you" I had one in there for each day we'd be apart from that point forward. I might have to do something like this for Father's Day now that we have little ones. PS. Thanks so much for this great blog. My friend forwarded me the link because of this post, and I'm totally smitten. Great idea! I might just do it for Father's Day! I LOVE your blog!! I've used several of your ideas and my husband has loved them. My husband is also in dental school- I feel your pain!! I'm thinking of giving this to him in July when he'll be studying pretty much all day every day for boards. Thanks for your blog! This would've been great last month for my fiance as he was doing his studying for boards, too!!! What a great idea! I think I'll have to still do this for him while he and I are apart for the next couple months. I hope all went well with his boards or will go well. Good luck with that and hopefully it's a smooth time for the both of you. I understand! Thanks for the tip on the Jar... I love those jars... Awesome idea! Such a cute idea. My husband is also a Dental Student and his part II's are coming up. I'll have to do this for him when the studying starts.